The pearl in the Indian Ocean! Sri Lanka. An Island of approx 65,610sq. km. Sri Lanka lies in the Indian Ocean off the southern tip of the coast of India. It lies between 5 55' and 9 55' north of the equator and between the eastern longitudes 79 42'and81 52'. The Communication is rarely a problem because English is widely spoken in all parts of the country. Place names and signboards are in the national languages and often in English. Official languages- Sinhala, Tamil and English. National languages- Sinhala and Tamil. The Island's proud history of over 2500 years and the breathtaking diversity of scenery will capture your heart and soul like no other destination. May the time you spend in the Island be filled with exciting experiences - memories of which you will carry long after you leave our shores. The palms clasped together and a gentle bow of the head accompanies "Ayubowan"(may you be blessed with long life), Sri Lanka's gentle gesture of welcome and respect. It is the age-old greeting of our people, and the chances are you will be greeted this way, wherever you happen to travel throughout the island. 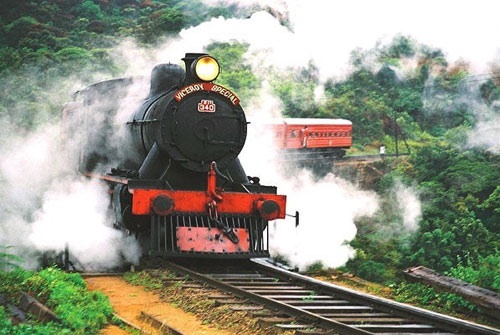 What may strike you most about Sri Lanka is its amazing diversity of scenery. It is possible to pass brilliant green paddy fields, sun-bronzed beaches, ruined cities, small lively villages, near desert regions, sanctuaries for wildlife in tropical jungles, and hill country tea plantations literally within hours of each other. Ancient Sanskrit literature refer to Sri lanka as Sinhaladvipa - Island of the Sinhalese. The people called by that name have inhabited this island from earliest historical times. 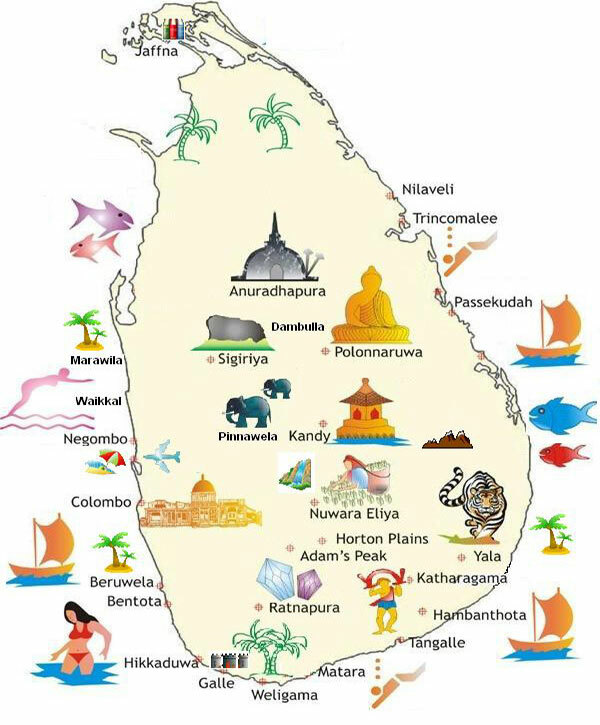 Traditions recorded in the historical chronicles of sri Lanka trace the origin of the Sinhalese to an exiled North Indian prince, Vijaya, and his retinue, who settled down in the island and established the Sinhalese kingdom in the 6th B.C. However, the earliest recorded civilization dates back to 380 BC, when Anuradhapura was established as the first Capital City. Following the advent of Buddhism in the 3rd Century BC, a civilization rich in Indo-Aryan culture took root. It produced the great cities with their "dagabas" which compare, and even exceed in size, the pyramids of Egypt, palaces and pleasure gardens, rich art and architecture and the gigantic irrigation works, many of which are still in use today. With invasions from neighbouring South India, the base of power shifted to Polonnaruwa and other cities such as Dambadeniya, Kurunegala,Kotte and Kandy. In the 16th Century the island had its first recorded encounter with the traders and colonisers of the West, with the arrival of the Portuguese in 1505. What followed was a period of nearly five hundred years during which the island came under the control and influence of the Portuguese, Dutch and British. While the Portuguese and Dutch ruled over the maritime regions for a rough 150 years each, The British established complete control over the island with the fall of the Kandyan Kingdom in 1815. They too ruled for 150 years before the country regained independence in 1948. The impact of many cultures over centuries, from South Indian to the Moorish and that of the western colonisers, have resulted in the country's culture being enriched by a rich diversity, much of which is in evidence today. 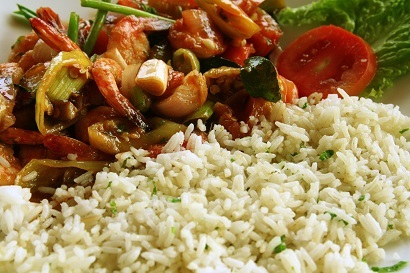 The island's economy has traditionally been based on agriculture, with rice as the main food. Spices such as crop, cinnamon, cardamom, nutmeg and pepper have been age old exports, as were gems and even peacocks and elephants. With western commercial influence, rice gave way to cash crops, until the British made tea the base of the economy. The people of Sri Lanka are of diverse races and faiths. The majority are Sinhalese who are Buddhists, while among the minorities the Tamils mainly Hindus are the largest, followed by the Moors who follow Islam, and a sharply declining number of Burghers, descended from the Portuguese and Dutch, who are Christians. There is also a considerable population of Christians among the Sinhalese and Tamils. The country was the first in South Asia to move away from a State-centred economic structure and embrace a private-sector led market oriented economy. The opportunities are many for foreign investment, with almost all exchange controls relaxed and many incentives given for foreign investment. Free Trade Zones, repatriation of profit, widespread education, a sophisticated middle class and a newly emerging capital market have made Sri Lanka most attractive to foreign investors in the past decade. Although well on the road to modernisation, the country and its people still cherish most of their traditional values and take pride in their rich culture. An aspect which continues to attract visitors from abroad, as much as the beauty and diversity of scenery, and the warmth and friendship of the people. Sri Lankan food. If you dip your finger into a local cooking pot you might be surprised by some strange flavours. Located right in the middle of the big shipping lanes of the ancient world, this spice-rich island has attracted many peoples to its beautiful shores. 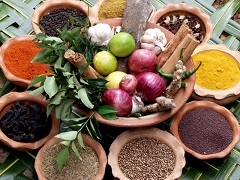 Sri lankan culinary art reflects the traditions of these various cultures. Imagine yourself in a jasmine scented world immersed in a bath filled with rose petals and sweet scented oil or gentle hands massaging your body with therapeutic oils while soothing music create an aura of perfect bliss. Sri Lanka has a unified exchange rate for foreign currencies which floats in response to basic exchange market developments. Sri Lanka has a decimal currency system. One Sri Lanka rupee is divided into 100 Sri Lanka cents. Currency notes are in the denominations are Rs 10/-, Rs 20/-, Rs 50/-, Rs 100/-, Rs 200/-, Rs 500/-, Rs 1000/- and Rs 2000/-.